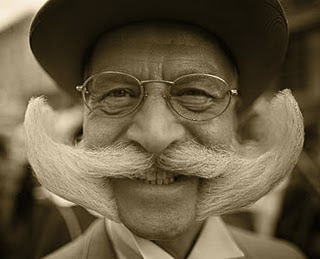 This moustache is even better than Nietzsche's. This morning I ran with two friends of mine. We've got a good eclectic group of runners here in Nashville from a variety of backgrounds. Our conversations are always winding and interesting, full of provocations and insights, rarely conclusive of anything. The running mind seems to skim from topic to topic rather than burrow in. One subject that we skimmed over today was my last blog post. One of my running partners, who happens to have a PhD in physiology, reminded me that I had finally cured my four-year battle with chronic achilles tendinitis by finding the right shoe (in this case, the New Balance 890). So, my last post, which encouraged readers not to worry so dang much about their shoe choice was really in bad faith. Maybe, he said, if I had paid more attention to shoe choice over the last four years I wouldn't have been running in pain for so long. I had to admit that he has a point. NB 890, I owe you an apology. One of the central distinctions in philosophy of knowledge (and it also appears frequently in ordinary conversation) is the distinction between theory and practice. We say things like this: "That's a good idea in theory, but it will never work out in practice." What we mean by this expression is that the arguments and ideas that are attractive to the intellect are not always the most workable ideas. Some thoughts give us pleasure to think, and this is almost their sole function: they calm us, they give us hope, or they assuage doubt. In a certain sense, these ideas still act, but their effects are more or less confined to the realm of feeling rather than the more objective realm of action. The ideas that actually work out in practice do not always have positive effects in the realm of feeling. The political process is perhaps the best example of this. We call those folks "ideological" exactly those who are more interested in thinking thoughts that please the intellect in particular ways. Those who are more pragmatic or compromising are less psychologically attached to ideas and more willing to forgo the more subjective satisfactions of certainty or ideological purity in favor of more social (and hence more vague) sorts of satisfaction, like agreement or progress, or problem-solving. So, in theory, yes, it would be nice not to have to worry about shoe choice. We could be the runner that we imagine ourselves to be: durable, immune to forces of marketing, tough as nails, blind to pain, and able to overcome all obstacles with a healthy dose of our powerful will. This is an idea that is pleasing to the intellect (though once written out, it does seem pretty flat and brutal) but also one that simply doesn't work in practice. In fact one of the reasons that this idea is so attractive is precisely because we aren't like this. It's a fantasy, one that we can disappear into in moments of self-satisfaction. Running is a practice; it's not a theory. The things that work in running are not always things that are pleasing to the intellect. The intelligence, then, that is required to train well is not theoretical, it's practical. Aristotle called this sort of intelligence phronesis, and he opposed it to theoretical intelligence. Phronesis is precisely that sort of real-world intelligence that is skeptical of too-easy answers. To be practically wise, you have to be careful in a strange way of trusting your intellect. The answers that are satisfying to the mind are not always so satisfying to the world. We here in the U.S. think of ourselves as practical people, and this value in practical living encourages a kind of anti-intellectualism. We are nervous about academia, the ivory tower, the Washington beltway, etc. We worry that the brightest and most attractive ideas might be dangerous. There's a sort of puritanism at work here: those ideas are most dangerous at the moment that they are most pleasing to think. Perhaps this is one reason that philosophy and philosophers have almost no public presence in our contemporary culture. Ours is not a philosophical culture because we refuse to take pleasure in ideas--and philosophy pretty much luxuriates in them. What's the upshot of all this? I'm not really sure. One thing that philosophy has taught me is that the truth of an idea is only one aspect of it. Ideas can do many things besides turn out to be true. They can encourage us, motivate us, and ennoble us. They can memorialize a prior time or give us hope in the future. Yes, it's important to be honest. It's important to be realistic. It's important to be practical. We ought to seek the truth. But maybe one thing that we ought also to do is to remember that ideas also have an aesthetic function in a living organism. I don't believe that we can have it both ways: seeking the truth will always be ugly and painful, if sometimes satisfying. Fantasies and myths will always be powerful forms of pleasure, and often repugnant and ignorant. A nostalgic tale that is not quite true may be just the thing to provide us motivation to tackle once more the difficult task of ascertaining the truth. Then again, it might just be a lie. Yeah so TTv2, was bashing the 890 the other day. He thinks some shoe that retails for $145 would be better for me. He has some very pragmatic reasons for believing that. Anyway, I'm going to take mine out for a little spin later with a couple of running buddies. I don't expect any deep thoughts--our running minds will skim from topic to topic as we dodge flying tree limbs in the remnants of a hurricane. Ha ha. Good old Thunder. Yeah, there's pragmatism and pragmatism. Have fun out there in the rain. There's also the possibility that you were right in the first place, that maybe your body was just done with the achilles thing and the 890s were just what you happened to be wearing at the time. I forget who said it first, but "Truth is never simple nor clear." For me, it is not the idea of obtaining the truth, but knowing that seeking the truth will put me closer to other goals (i.e. family member, runner, educator). Indeed, truth is never simple, nor clear. Which makes me feel better about my blog posts. Thanks for reading! Ha, no, I love the open market - one of the best parts about it is you don't have to buy anything if you don't want to! But I'll always argue for heresy. Considering your friend has a PhD in physiology, isn't it possible that he was engaging in thoughts that were appealing to his mental model or worldview? In other words, his suggestion that the shoes were the issue for the last few years may be his own theoretical answer, and may not be the practical one at all. Of course, this sort of proposal is pretty much impossible to prove one way or another, because everything is in constant flux. Six Sigma is not compatible with endurance training. I think that ideas serve as starting points for practice. We have to think about what we want, and how to get there. Then we have to try it out. From a pragmatic point of view, the value of your ideas and beliefs can be based on how true they are, and if you believe it was the shoes, with nothing to point to the contrary, then how can it not be true and valuable to you? Of course, someone else may have a completely different set of experiences that would invalidate your beliefs, but that person is completely different than you, so the circumstances are different. Scout7, you've described the pragmatic theory of truth pretty well. The truth is what is valuable, and the valuable is what's true. I just want to note that there is a tension always within pragmatism between the two sides of this equation. Is something valuable because it's true--that is, because it accurately and somewhat universally describes or represents a situation? Or--and this is different--are the statements that we call "true" simply true because they work in a particular case. I'm afraid that I'm not being clear, but if there is a problem with the pragmatic conception of truth, it's that it reduces the "critical edge" of truth. The sense that we have about a true statement that it is true whether we want it to be or not. Maybe this idea is summed up in the simple expression: "The truth hurts." I think my physiologist friend is coming from this realist angle on the truth; it's an angle, after all, that keeps the scientist seeking truth despite the inconveniences that this search produces for their own lives: the long hours in lab, the difficult quest to continue learning, etc. So, it right to say that ideas are starting points to practice? I think that most scientists would reverse this statement: that practices ought to lead to true ideas. In the end, I think that this point of view can be reduced again to pragmatic questions, but perhaps it is worth letting it stand on its own in order to respect the distance that it carves out from the pragmatic perspective. This distance can ensure that we don't fall into a facile and convenient "pragmatism" and returns to truth the power not only to confirm our practices, but to change them. In the last paragraph of your response to Scout, do I understand correctly that you are advocating a realist notion of truth? I could not tell 100% what you are saying... wouldn't mind some elaboration of this point. I am not advocating, necessarily, a realist view of truth. I am--in good pragmatic fashion--trying to say that the realist view of truth may be useful for some purposes, say scientific inquiry as it is practiced today. The scientist believes in Truth and is motivated by it, and this is what keeps him in the lab, this lovely idea of coming up with a true picture of reality. On the other hand, I think the realist picture of truth that funds contemporary scientific practice is highly problematic. It has led to the enormous gap between scientific knowledge and the application of that knowledge. All the smart people set out to find something like Pure Knowledge and don't worry about the (often dirty or dangerous) consequences of that knowledge. In this way, the realist picture of truth may give license to some scientists to disregard the ethical implications of their science. So, to answer your question directly, being generally committed to the pragmatic picture of truth I am not so sure I have a metaphysics of truth. I want to say that a realist picture of truth--just like other pictures of truth--may be useful in some contexts, for some purposes. As both a philosopher and pragmatist, however, I think I need to let the realist picture of truth challenge my pragmatic habit of incessantly pluralizing and contextualizing--because this is the only way I can continue to verify my commitment to pragmatism. Thank you, this was a great answer. The second sentence is what I needed to hear to clear things up. The blog post definitely took a pragmatic stance, so I was confused by the end of your response to Scout. I also really liked the last sentence if your response to me. I'm probably a bit of a realist (and not for pragmatic reasons) - science is my first love. But these are deep waters for me. Truth makes my head spin. Something to think more about! My family doctor has offered to inject me with cortisone but my actual ankle doctor was very clear that it is NOT a good idea to do that because it can rupture it.